We have information you must know before you buy the Titan. The 2019 Titan features an updated infotainment system with Apple CarPlay and Android Auto, available Fender audio system, and a rear seat minder that lets you know if a rear door was opened prior to departure. Current offers, including the attractive cash-back rebate detailed below, are regional and available through April 30, 2019. Our examples are based on a Los Angeles location. For new 2019 models, there’s a $4,000 cash-back rebate available. Unfortunately, this cannot be combined with the promotional finance rates listed below. Promotional rates start at 0% APR for 36 months, 1.9% APR for 60 months, 2.9% APR for 72 months, or 3.9% APR for 84 months. Note that cash-back incentives are not compatible with these rates. You'll need to finance at the standard APR, find another lender, or use a different method of payment to remain eligible for those. Lease the 2019 Titan S 4x4 Crew Cab from $218 per month for 24 months with $3,999 due at signing. This equates to an effective cost of $385/month, a deal we considered to be an outstanding value given the vehicle's MSRP. 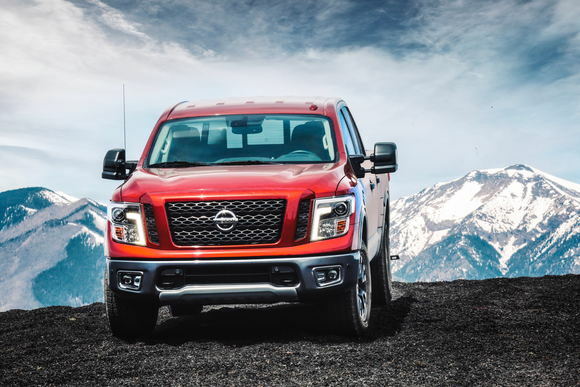 The offer included an allowance of 10,000 miles per year and a $2,975 loyalty/conquest discount intended for current Titan owners/lessees and/or those who own or lease a competing truck. The second-generation Nissan Titan stands tall in the full-size pickup segment. Completely redesigned in 2017, the Titan can be configured in 22 unique ways. While it’s mainly a carryover from last year, the 2019 Nissan Titan offers a few enhancements that make it a worthy contender in this competitive segment. The new Titan includes an improved 7-inch touchscreen infotainment display that now features Apple Car Play and Android Auto. A new Rear Door Alert system that reminds drivers to check the back seat is standard on King Cab and Crew Cab models. The Titan receives its motivation exclusively from a 5.6-liter V8 engine that belts out 390 horsepower and a nearly identical 394 pound-feet of torque. This powerplant is paired with a seven-speed automatic transmission and is EPA-rated at 15 miles per gallon city, 21 mpg highway, and 18 combined. Rear-wheel drive is standard, while four-wheel drive is available for an additional $3,140 to $3,400, depending on the trim level and cab type. The Titan is available with three different cab types: the Single Cab with an 8-foot bed, the King Cab and its 6.5-foot bed and rear-hinged rear doors, and the Crew Cab with a 5.5-foot bed and four full-size doors. The Titan S starts at $31,985 with the Single Cab (all prices include the $1,395 destination charge), $35,255 with the King Cab, and $37,975 with the Crew Cab. This is the base trim level and is mainly intended as a fleet or work truck. The S rides on 18-inch wheels and comes sparsely equipped with a lockable tailgate, LED cargo bed lights, and fixed cargo bed tie-downs. The S also features a 7-inch touchscreen infotainment display with a rearview camera, cruise control, and Bluetooth connectivity. The S Utility Package ($845) adds a Class IV tow hitch receiver, spray-on bedliner, and front overhead storage console. The Titan SV introduces more consumer-friendly features. Pricing begins at $35,615 for the Single Cab, $38,685 for the King Cab, and $41,165 for the Crew Cab.The SV features power heated side mirrors, chrome exterior trim accents, and skid plates covering the oil pan and fuel tank on four-wheel-drive models. Inside, the SV adds cloth seats, floor carpeting, interior mood lighting, an overhead console, a front sun visor, and a light for the glove box. There are quite a few package upgrades offered with the SV. The SV Tow Package ($495) adds front tow hooks, puddle lights on the side mirrors, extendable two mirrors with turn signal indicators that are heated, a trailer brake controller, and a trailer light check. The SV Utility Package ($1,145) introduces a spray-on bedliner, a Utili-track channel system with four tie-down cleats, a bed-mounted 120-volt power outlet, LED under-rail bed lighting, and lights that illuminate the tailgate area. The SV Convenience Package ($845) bundles automatic on/off headlights, blind-spot monitoring, rear cross-traffic alert, dual-zone automatic climate control, a body color rear bumper, push button start, a leather-wrapped steering wheel, an auto-dimming rearview mirror, a Class IV tow hitch receiver, and front and rear parking sensors. On King and Crew Cab models, the Convenience Package costs $2,015 because it also includes front captain's chairs, a configurable center console with a 120-volt and 12-volt power outlets, navigation with voice recognition, an eight-way power driver's seat with lumbar support, heated front seats, two rear USB ports, rear air conditioning vents, chrome interior door locks, rain-sensing windshield wipers, power heated outside mirrors with turn signal indicators, and a power sliding back window with a defroster. Also available on King and Crew Cab models is a Chrome Package ($1,245) and a Texas Titan Edition package ($1,295). The former adds 20-inch chrome-coated aluminum-alloy wheels, all-season tires, a chrome-finished front grille, a chrome exhaust tip, and metallic kick plates and a Texas Titan Edition package ($1,295). The latter brings all of that same equipment and Texas Titan Edition badging. Two other packages are available on Crew Cab models. The SV Leather Package ($895) bundles leather seating and a four-way power passenger seat, while the Midnight Edition ($1,250) adds black 20-inch wheels, fog lights with black surrounds, blacked out exterior and interior trim, and Midnight Edition badging. The four-wheel-drive-only Titan PRO-4X starts at $46,175 as a King Cab and $48,405 in Crew Cab form. This off-road-inspired trim adds 18-inch wheels with all-terrain tires, includes skid plates covering the transfer case and radiator, front tow hooks, heated black exterior mirrors, and a Class IV towing hitch receiver. The PRO-4X is enhanced with Bilstein off-road shocks, a hill descent control system, a switch-operated two-speed transfer case, and an electronic locking rear differential. On the inside, the PRO-4X features front captain's chairs, an eight-way power driver's seat with lumbar support, a leather-wrapped steering wheel, dual-zone climate control, rear air conditioning vents, . The PRO-4X Utility Package ($1,845) includes the features from the SV's Utility Package, an electronic tailgate lock, a rear bumper assist step, front and rear parking sensors, a trailer brake controller, a trailer light check, puddle lights on the side mirrors, proximity activation to the trucks lights, a power sliding back window with a defroster, heated extendable tow mirrors with turn signal indicators, and a 10-speaker Fender audio system. The PRO-4X Convenience Package ($3,295) seats with PRO-4X badging, memory for the driver's seat and steering wheel, a power tilt and telescoping steering column, leather seating, a four-way power passenger seat, a heated and leather-wrapped steering wheel, heated front seats, auto-dimming outside mirrors, side mirrors with reverse tilt-down, a HomeLink universal transceiver, NissanConnect Services, remote start, and an auto-dimming rearview mirror. Finally, the PRO-4X Premium Package ($795) introduces heated and ventilated front seats, side mirrors with reverse tilt-down, and a surround-view camera system. Available only as a Crew Cab, the Titan SL starts at $50,035 and increases the robustness of this full-size pickup truck. The SL adds 20-inch alloy wheels, heated chrome exterior mirrors that are auto-dimming, front and rear parking sensors, and front tow hooks. Inside, the SL becomes quite posh, adding leather upholstery throughout, a remote starting system, heated front seats with memory, a four-way power adjustable passenger seat, remote engine start, a Fender audio system, NissanConnect Services, and a power tilt and telescopic steering column. The SL Tow Package ($445) adds front tow hooks, a trailer brake controller, a trailer light check, and extendable tow mirrors with turn signal indicators. The SL also makes the Chrome Package ($1,245), the Texas Titan Edition ($1,295), and the Midnight Edition ($1,250) available again. The range-topping Platinum Reserve starts at $55,925 and is also only available with the Crew Cab. It stands tall on 20-inch dark chrome-coated alloy wheels, adds a splash of dark chrome trim enhancements, and features two-tone front and rear fascias and body sides. The interior features heated and cooled front seats, heated rear seats, a heated steering wheel with a wood insert, wood instrument panel finishers, and dark chrome-accented cup holder trim and vent knobs. The Platinum Reserve Utility Package ($750) adds an electronic tailgate lock, a rear bumper assist step, and dual in-bed storage boxes. Available on 4x4 models, the Off-Road Package ($245) bundles all-terrain tires, 18-inch dark aluminum-alloy wheels, and Bilstein off-road performance shocks. 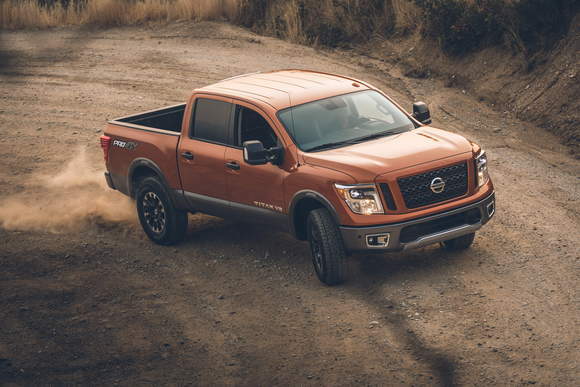 The 2019 Nissan Titan continues to gain momentum against the big three of pickup truck dominance. It has a long way to go, but with all sorts of configurations available, there's a Titan for just about any buyer. Full-size disappointment. The Detroit Three – Ram, Chevrolet, and Ford – have been bolting beds behind cabs since the era of Woodrow Wilson and Prohibition. Nissan's history with building trucks is almost as lengthy, but the company has only been trying their hand at selling a full-size pickup since the waning days of George W. Bush's first term. Unfortunately for the Japanese brand, their expertise with pint-sized trucks hasn't quite translated to the big-boned stuff. No matter what parameter is used to judge the 2019 Nissan Titan, the lack of polish is quickly apparent when evaluating it in anything but a vacuum. Lackluster capability. The disappointment begins with the payload and towing capacities, the two holy yardsticks that every truck is measured against. In the truck world, street cred hinges on these numbers with the same dependency that muscle cars have on their zero-to-60 mph runs and quarter-mile times. These metrics segregate the wannabes from the real deals. The Titan falls squarely into the former category. Maximum payload sits at 1,610 pounds. This seems impressive enough by itself, but the competition proves otherwise. A Ford F-150, the best-selling pickup out there, maxes out at 2,302 pounds. The new Ram matches the Ford almost to a tee. The newly-redesigned Chevy Silverado outdoes them all with up to 2,543 pounds of potential payload. Even the aged Toyota Tundra, which also plays second fiddle to the Americans in popularity and capability, can haul 1,730 pounds in the bed. It's the same story in towing. The Nissan job will pull no more than 9,400 pounds. Again, it's an impressively large number … until you look over at the competing rigs. The F-150 pulls up to 13,200 pounds, the Ram 12,750, the Silverado 12,500, and the Tundra 10,200. The numbers don't lie. When it comes to doing the things trucks are bred to do, the Titan comes up short. Choppy ride, decent performance. While the domestics offer enough powertrains and bed/cab combos to confuse Las Vegas card counters, Nissan shoves a 5.6-liter V8 under the hood of every Titan regardless of trim or cab style. Note that the Titan XD, covered separately, offers an optional Cummins-built diesel V8 as well. The venerable 5.6-liter motor has been powering Nissan's larger body-on-frame stuff for a while now, and is plenty stout with its 390 horsepower and 394 pound-feet of torque. A seven-speed automatic transmission makes easy work of the gear changes. The combo doesn't deliver great gas mileage at an EPA-estimated 15 miles per gallon city, 21 mpg highway, and 18 combined, but no full-size truck with eight cylinders does much better. When potential buyers write off the Titan from their short list, it won't be because of the powerplant. The ride, however, could get the blame. Out on the road, the Titan feels behind the times, inept at dampening bumps and jolts with anything resembling grace. And now that the competition is ramping up their efforts at making their trucks ride like crossovers, the sense of pitch-and-buck in an unladen Titan seems more exaggerated than it would have been even just a couple years ago. Value. Perhaps the biggest redeeming feature of the Titan is its value play. A regular cab base model – one that comes with a V8, power windows and locks, and a 7-inch touchscreen with smartphone compatibility, among other things – starts at right about $31,000. By contrast, a base F-150 XL optioned up with a V8 is already at $30,300, and that's before getting any power-actuated amenities standard on the Titan. On the other end of the spectrum, the ritziest version loaded with all the bells and whistles tops out at about $60,000. This is well below what the priciest domestics cost; those luxo-trucks have no trouble shooting past the $70,000 barrier. It's important to note, though, that the loaded-up American trucks offer much more in terms of features and, perhaps more importantly, perceived luxury. Climb into a leather-lined Ram 1500 Limited or F-150 Platinum – both of which compete price-wise with the Titan's uppermost Platinum Reserve model – and you come away genuinely impressed. The style, quality, and features all seem to belong in something wearing a far more premium badge. The Nissan never suggests anything of the sort; even in its most dapper trimmings it still feels like a Nissan pickup. The sensation is akin to the old Eddie Bauer F-150s or Silverado-trimmed K1500s of the 1990s. They were both the nicest examples of their respective product lines, but, at the end of the day, both were still working-class pickups. Nowadays, the market demands that trucks be able to double as genuine luxury boats, but the Titan clearly hasn't gotten the message. Final thoughts. Truck buyers are a lucky bunch. The hyper-competitive segment has manufacturers consistently trying to one-up each other in a never-ending game of who can build the burliest, torquiest, most luxurious pickup. In the midst of this ongoing tussle, Nissan seems to have decided to sit it out on the bench. To say the 2019 Nissan Titan is outclassed would be an understatement. Compared to rigs like the new Ram, the Nissan is a mediocre high school drama club member trying to share a stage with Broadway stars. It's in its own league – one that's inferior to where the domestic trucks currently stand. The Titan's primary selling points are the deep discounts that Nissan dealers are quick to offer and the five-year/100,000-mile warranty, which is the longest in the class. But these two small redemptive qualities can't overcome the last-in-class capability, the uninspired interior, and the flinty ride. Better trucks are out there, so most people are going to buy one of those instead. We have partnered with trusted dealers in your area to give you a great price on the new Nissan Titan.